Decorative Life: 14-28 days or even longer. Harvest when three-quarters or more of the flowers on the spadix are open. The longer the stems, the greater the weight and the larger the stem diameter, the shorter the vaselife. Using ‘Ozaki’, Paull et al. (1992) showed that vaselife varied from 8-69 days depending on growing season and fertilization programs. For example, nitrogen and potassium rates accounted for 13 and 17% of the vaselife variations. Low nitrogen levels are better. Up to 71% of the postharvest vaselife is predetermined at harvest. Depending on cultivar, store at 57-63F because at lower temperatures chilling damage will occur. Chilling damage symptoms include flowers turning gray to blackish, similar to what a banana first looks like after being stored in a refrigerator. Can be stored up to 30 days at 55F. Can be held at 40F for about 2-3 days before chilling damage occurs which indicates that it can be trucked to most places within the US and Canada with other flower species in trailers that are often set at 38F. The flower consists of a wiry, leafless stem bearing at its end a flat heart-shaped spathe from 3-6 inches across. Spadix (flower) often dipped in wax to prevent drying. The actual flowers occur on a columnar structure called a spadix that protrudes 3 to 4 inches out from the middle of the spathe. Spadix maturity (number of open flowers) is determined by the degree of roughness. 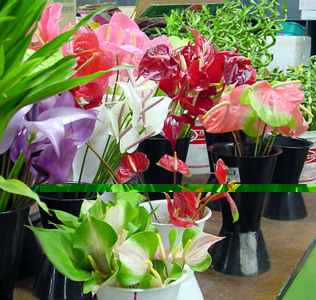 Anthurium is Greek for “tailflower” referring to the spadix that protrudes from the spathe like a tail. The specific epithet name of cultorum means one that is commonly cultivated. Submerging flower heads upside down in room temperature water for two or more hours to help hydrate and extend vaselife is not a proven practice but is often recommended. A potted plant relative of this species has the common names of White Anthurium and Peace Lily but is a different genus, Spathiphyllum. Common species collected in Colombia by Ed Andre in 1876. Hence, it is very common in Colombia. Several arum family members (including taro) are grown in tropical regions for their edible tubers, representing starch staples for large populations. Many other species are grown for their beautiful foliage. Ramcharan (2000) showed that water quality can greatly affect vaselife and that flower foods may not always be beneficial. Paull and Chantrachit (2001) showed that the growth regulator benzyladenine (BA) used as a spray or dip can extend vaselife and that its effectiveness depends on cultivar, harvest stage and season of the year. At the time of this writing, there are two products on the market that are believed to contain BA, Hawaiian Mist and FloralMist. From Lianne Moore: Vaselife can be reduced when held in foam.